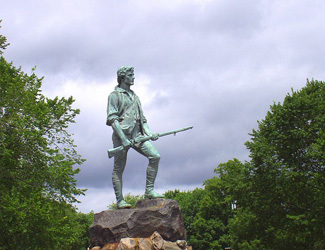 Lexington, Massachusetts was first settled in 1642 as a farming community. The town experienced rapid housing development after World War II with the growth of the Boston urban area and the decline of agriculture. While the town is primarily residential, a number of industries and commercial establishments employ more than 16,000 people in Lexington. Services and manufacturing are the two largest employment sectors. The major shopping area is the central business district. Lexington Center is a well-maintained area with retail stores, professional offices, banks, and restaurants.